In the library, I was trying to find an artist to write about by looking at pictures of their works. Finally, I encountered the second picture that made me thought "holy c--(beep)" and gasped in awe. 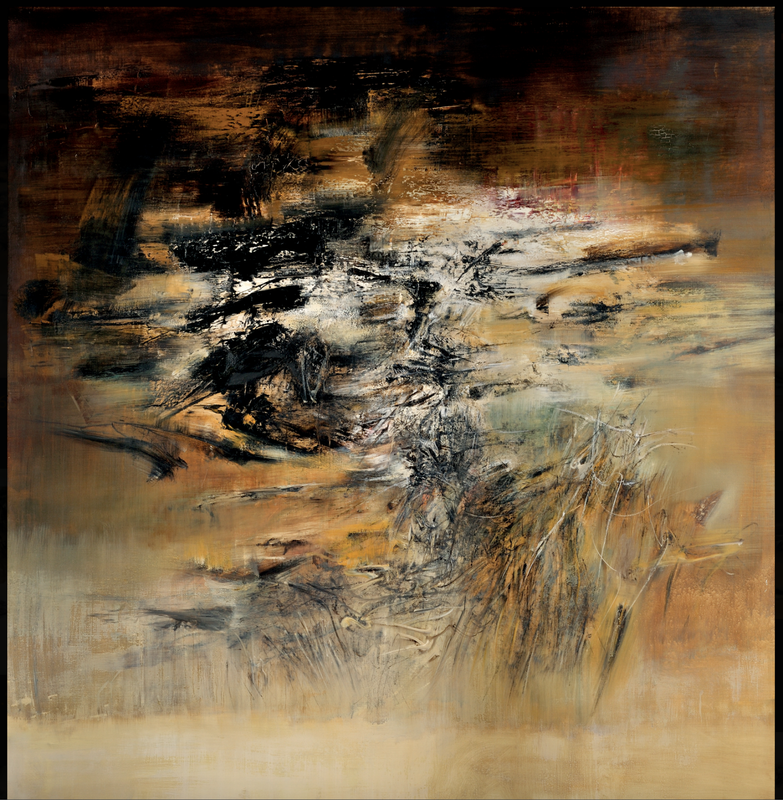 The first picture was that of sculpture, so I moved on and found in Almanac 2016 another one, an oil painting by Zao Wou-ki, as shown below. "'… At the National Beaux-Arts School in Han Tcheou, they taught us all the worst things the west had to offer. They made us draw Greek plaster casts.'" "'... In truth, painters trained like this are only fit for painting propaganda.'" "'I had learned the Western style: it was normal to go there.'" "That may be. But was there not also a need to get closer to that flame which is always changing place and school--as if to force us to understand that no place, no school possesses it--that flame which then seemed to be centered in Paris?" "'... That same afternoon, I was at the Louvre. I can still remember that visit. ... Certain painters--Botticelli, Fra Angelico--disappointed me: I liked them better in reproduction. All those constipated Madonnas!'" "'The black always crackles a little. The blues do not change at all. Ivory black is a troublesome color, as I found out at my own expense.'" "Then why do you use it?" "'Because no color has such intensity.'" Zao's use of ivory black can be found even in the first work that marks his artistic breakthrough in finding his artistic voice. 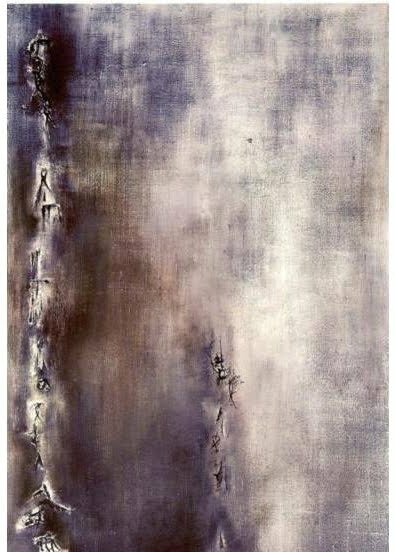 This 1954 masterpiece named "Wind" (translated from "Vent" in French), is Zao's first purely abstract work. 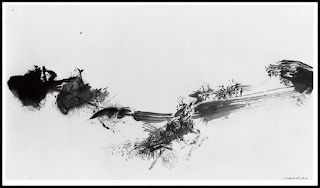 The inky black forms rising in two columns are abstractions of oracle bone characters, the most ancient Chinese scripts. In the following years, Zao committed himself entirely to abstract (oil) painting. After 1959, he rarely used even figurative titles, only marking the dates of those painting's completion. Below is an example of such paintings. "An artist friend once asked about my research. Hearing that I studied Zao Wou-ki, he grew suddenly pensive. 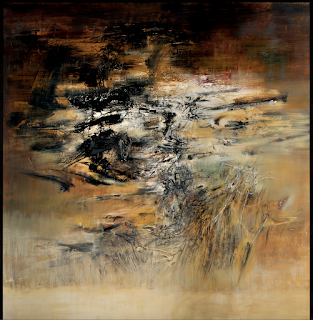 'Zao Wou-ki,' he mused, 'his work isn't representative of either Chinese or French art.' 'Yes,' I answered. 'He represents himself, and that is enough.'" Schneider, Pierre. Louvre Dialogues. New York: Atheneum, 1971. Print. Samella Lewis was born Samella Sanders February 27th, 1924 in New Orleans, Louisiana. She studied with sculptor Elizabeth Catlett at Dillard University in New Orleans before finishing her Bachelor’s of Science in Art degree at the Hampton Institute in Hampton, Virginia. After completing her undergraduate career, Lewis became the first African-American woman to achieve a doctorate in art history and fine art from the Ohio State University in 1951. Much of Lewis’ career was centered on furthering and promoting African-American involvement in the arts. In 1975 she co-founded Black Art: An International Quarterly, later renamed International Review of African-American Art, and helped establish the Museum of African-American Art in Los Angeles, California. She remained senior curator of the museum until 1986. Much of her early work, which was mainly prints on paper, explored themes of violence and oppression, which afflicted African-Americans. Along with her husband, Paul Gad Lewis, Samella Lewis became an active participant of the Civil Rights Movement. She continued to work to further the movement through her art while serving as the head of Florida Agricultural and Mechanical University. After the Ku Klux Klan home targeted her family, Lewis moved to New York to teach art history at State University of New York, where she worked to establish a local NAACP chapter. Much of Lewis’ work is genre paintings and portraits created using watercolors, charcoal, and wax crayon. Later in her career, Lewis began to explore digital means for her artwork. Lewis studied and taught art history for much of her career. As such, Lewis has a keen eye for using her art as a means for social change and commentary. 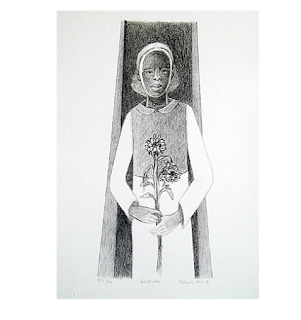 One of her early pieces, Migrants, seems especially relevant in today’s political climate. It features various figures, which seem to be of different facets of African-American culture, all-sitting together in a dark field. The contrasting colors and use of value and line work to create such an expressive image really draws the viewer in, and the accompanying social commentary is very reflective of Lewis’ engagement in the Civil Right’s Movement. Gertrude (2004) is an example of one of the works by Lewis that caught my eye. The drawing pictures an African-American girl, holding a flower. Her work truly celebrates African-American culture, celebrating dark skin complexion and capturing the beauty of the people. In particular, I was drawn to this piece because of the dark-skinned model, which stands in direct contrast to the typical light-skinned beauty standard celebrated throughout the United States. Further, her use of value to create shading and texture, especially in the hair, was particularly interesting to me. There was something relatable about this image. Another poignant example of Lewis’ mastery of line work and value, Twentieth Century Wiseman captures a slightly darker side of African-American culture: superstition. Of particular interest for me in this picture is the geometric shapes employed to create the figures and the faces. It presents as a different take on the African-American figure, highlighting stereotyped African-American features without creating a caricature of the individual. "LEWIS, Samella." Benezit Dictionary of Artists. Oxford Art Online. Oxford University Press, accessed February 21, 2017, http://www.oxfordartonline.com/subscriber/article/benezit/B00204832. Otfinoski, Steven. 2011. African Americans in the Visual Arts. New York: Facts on File, Inc, 2011. eBook Collection (EBSCOhost), EBSCOhost (accessed February 22, 2017). On 17 June 1898, Maurits Cornelius Escher was born in the town of Leeuwarden in the Nerthelands and was the youngest son of George and Sara Escher. Growing up he attended the hogere burgerschool in Arnhem where he formed a relationship with his art teacher, F. W. van der Haagen, who recognized and encouraged his talent. Escher's teacher first introduced him to and taught him how to make linoleum cuts for prints. This would later lead to Escher making woodcuts and considering studying architecture at the School for Architecture and Decorative Arts in Haarlem. Although he had the intention to eventually become an architect, he ended up devoting his studies to the graphic arts and began a full program in the graphic arts. At this point, most of Escher's work was woodcuts, but one of his more pivotal journeys was his sketching trip through Italy and Spain in 1922. In particular, when he visited Granada, he was enamored by the intricate decorative designs of the Alhambra and Moorish architecture and became fascinated with the geometrical symmetries and interlocking repetitive patterns in the tiles on the walls and ceilings. This would later light his continued interest in mathematics and tessellation and later influenced his work. In 1941 and 1942, Escher wrote about his revelations in his sketchbook named Regelmatige vlakverdeling in asymmetrische congruente veelhoeken. Upon his return, he translated his sketches from Granada to his woodblock designs. These designs tended to shift towards being highly symmetrical following strict pattern rules. These pattern rules were guided by Escher's urge to "fill the plane" and leave every space filled. Some of these pattern rules included the rule that each repeated shape had to be individually recognizable but also interconnected and integral to the formation of its adjacent patterns. Later in his life, Escher would move to Italy and live in Rome from 1923 to 1935. It was around this time that Escher met his wife, Jetta Umiker. However, in 1935, due to the political climate of Italy, he was forced to leave and moved to Switzerland. But shortly after, he would move to Belgium and eventually the Netherlands, where he stayed until 1970. Escher completed most of his work during his time in the Netherlands, and passed away on 27 March 1972 at the age of 73. I particularly found Escher's work fascinating because of how different in nature it was to most other works. There was a certain beauty of the interlocking shapes and figures that attracted me. The creative division of plane and use of intricate, interlocking designs was fascinating to see and had my eyes traveling across the page. Escher's use of mathematical concepts, even if he didn't particularly intend to, to create his works was very impressive. His designs gave a sense of completeness to his work in the sense that every space was filled but also a sense of incompleteness in that the drawing seemed to continue to infinity and had no visual ending cue. This dissonance was particularly drawing to me. 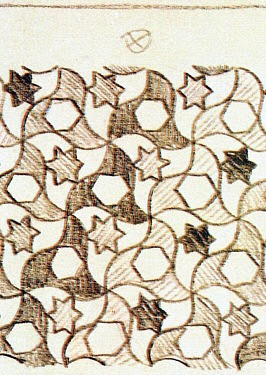 Early sketch of Moorish tiling in Alhambra. 1936. Sketch. The sketches above show some of the early influences of Escher's trip to Granada. A lot of his sketches model the tiles interlocking designs that he saw in Moorish architecture. These sketches would later be translated to his woodcuts. These sketches marked his first fascination with the patterns and geometric patterns. I chose these sketches because they serve as clear evidence of the strong influence his sketching journey through Italy and Spain had on him that would influence his later work. Eight Heads. 1922. 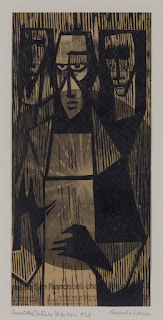 Woodcut, printed with nine impressions. 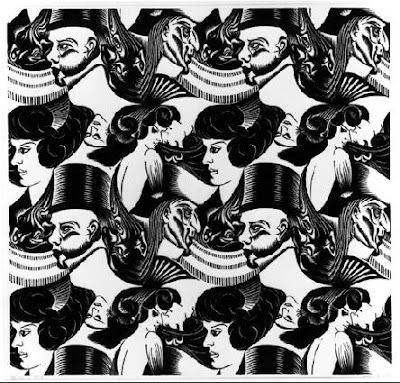 Eight Heads showcases Escher's commitment to his rules that he set out; that the interlocking figures each had to be individually recognizable and also a part of the composition of the adjacent figures. 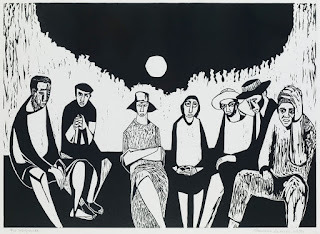 I liked this woodcut because the design is well thought out and intricate and goes beyond simple shapes/polygons like in his earlier sketches but instead makes use of seemingly non matching patterns (such as human heads) and weaves them together very well. For example, the way Escher uses the noses and brows of the human heads to places the heads upside down and adjacent to each allows for a filled plane while not sacrificing the individual distinction of the heads themselves. Relativity showcases Escher's delving into seemingly infinite works. 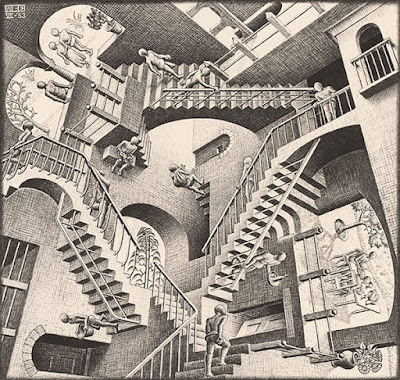 By cleverly using divisions of plane and geometric features, Escher was able to create a work that at first glance seems realistic but upon further examination is physically impossible. Escher's works of this nature tend to be the most popular and understandably so. I enjoyed this work because of his clever use of angles and perspective to create an impossible structure that seems right. To me, this work showcases Escher's mastery of three dimensional representation on a two dimensional medium. Sylvia Plath, a celebrated American poet from the mid-20th century, was known for the dark complexity of her work—themes of death, loneliness, and suicide preside in Plath’s poetry, and violent or disturbing images were commonplace. Plath’s work is considered part of the Confessional school of poetry, a movement in 1950’s America that rebelled against midcentury suburban ideals and confronted topics like personal trauma, mental illness, suicide, and sexuality. Her suicide at 30 cut short a promising literary career—while her two young children were away (her husband had left her for another woman a few months previous), Plath stuck her head in a gas oven and turned it on. 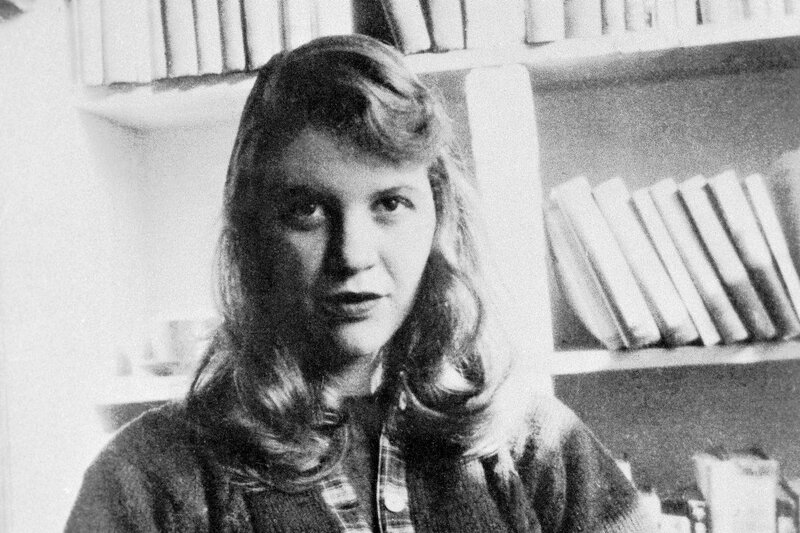 Her novel the Bell Jar and volumes of poetry Ariel and The Collected Poems would go on to earn her great critical acclaim and the first posthumously-awarded Pulitzer Prize for poetry. As was taught to me in high school, her poetry and prose were the extent of Plath's artistic expression. I was surprised to see her name on the spine of a book in the stacks underneath Lilly, and after flipping through the first few images had to double-check that I had read the cover correctly. Citronnade Stand in Tuileries. Pen and ink on paper. Her bold pen sketches remind me of nothing more than whimsical illustrations in a children's book. I love the unapologetic use of hard line and simple shading, which seem to be a constant in her drawings. I was frankly a little unsettled by the contrast between the dark rawness of her poetry and the innocence of her art--apparently Plath was devoted to visual art (pastels, painting, pen, etc) and was unsure whether to continue professionally or commit more fully to her writing until she was 20. Some critics contend that though it remained a comfort to her thought her life, her drawing never reflected the depths of her spirit the way her writing did and was instead as "polite and proper" as Plath was brought up to be in her well-to-do 1950's family. Many of her drawings are quite bucolic-- some of the scenes wouldn't be out of place in a Constable exhibition. Indeed, while traveling with her husband she became so taken with a farm they visit that she wrote and underlined several times "must return to sketch cows again" in her journal. 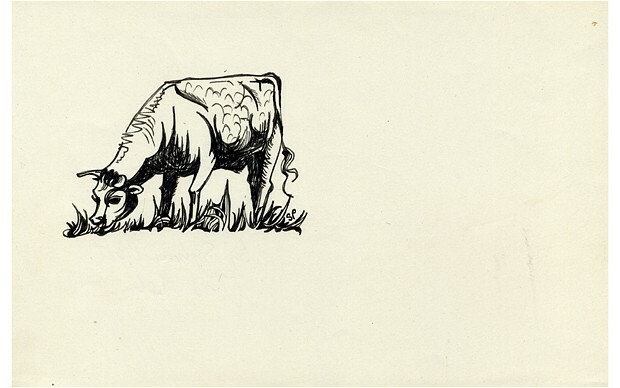 I am particularly surprised and impressed by the fanciful treatment of this cow's curly tail--the levity of her drawings recalls the (creepily) childlike rhyme schemes she juxtaposed with the frightening themes of her poetry. I shudder to think what a Plath children's book would be, but I would definitely like to look at the pictures. Her botanicals are the darling of angsty twenty-something ink-seekers everywhere--if you google "Sylvia Plath flowers", you're equally likely to come up with poppy tattoos of dubious merit as Plath's actually sketches. Her pieces are very crisp and very stylized, almost to the point of looking like woodblock prints. Discovering this more fanciful and light-hearted side of Plath has proven a fascinating counterpoint to what I thought I knew about one of America's greatest authors. Ted Hughes, the unfaithful husband who would go on to become the poet laureate of England and eventually himself committed suicide, wrote a poem on Plath's art. When you drew the market at Benidorm. I sat near you, scribbling something. Kept coming to see you had them properly. "Culling the Poetry Classics: Sylvia Plath." LitReactor. N.p., n.d. Web. 22 Feb. 2017. Plath, Sylvia, and Frieda Hughes. Sylvia Plath: drawings. London: Faber and Faber, 2013. Print. "Sylvia Plath." Poetry Foundation. Poetry Foundation, n.d. Web. 22 Feb. 2017. <https://www.poetryfoundation.org/poems-and-poets/poets/detail/sylvia-plath>. Tmg. "Sylvia Plath drawings at The Mayor Gallery." The Telegraph. Telegraph Media Group, 25 Oct. 2011. Web. 22 Feb. 2017. I chose to highlight the work of Lee Hammond, a mostly self-taught American artist and art instructor from Kansas City. She attended the University of Nebraska in 1976. She teaches nationwide and even worked for NASCAR to produce art for the company, and currently works as a Police Composite Artist for the Lincoln Police Department in Nebraska. My first exposure to Hammond’s work was a few years ago through her book How to Draw Lifelike Portraits from Photographs, one of her best-selling art instruction books. I always loved to draw realistically when I was younger but never had any formal instruction. Hammond’s book really explained a novel yet straightforward method (to me, at least) to really look at the image or scene in front of you and try to project it onto the paper as it was, with minimal input from preconceived notions of what an object is supposed to look like, with the help of grid lines to establish a proportional line drawing. Her graphite works focus heavily on blending pencil lines smoothly with blending stumps and pulling out the highlights of the light with different erasers, similar to how we’ve been learning in class to use the kneaded eraser and gum eraser as tools to draw or carve with and not simply to erase perceived mistakes. This approach to drawing, building up and blending contrasting values and then pulling out the light from on top of it, really makes drawings of complex objects like hair look super-realistic, as can be seen in this Hammond graphite portrait below. I also really appreciate how she is able to capture nuances in skin tone and hair color with just pencil by using a varied application of value and shading. I appreciate how Hammond works with a variety of media—her work features graphite, colored pencils, and acrylic, and her subjects vary widely from people to landscapes to still lifes. Her style of painting acrylic landscapes focuses on capturing textures and color contrasts as they appear, rather than trying to paint what a person’s brain thinks is supposed to be there. For example, in her book Lee Hammond’s Big Book of Acrylic Painting, her chapter on landscapes explains how to use textured tools such as kitchen sponges to capture the porous and layered appearance of leaves on a tree, instead of trying to outline each individual leaf on a branch. The sunset below (for which she provides a tutorial in her book) simply uses black paint and a sponge to capture the trees in the background. As can be seen above, Hammond’s style of acrylic painting also doesn’t shy away from strong applications of color. Red and orange aren’t typically the colors I would think of when painting a sunset or water landscape, but the pronounced use of these colors really captures the intensity that the original scene must have evoked. She also does a good job of capturing lighting variations on objects, and portraying how lighting can affect the perceived hue of an item. The acrylic rendition of a grassy stone pathway below really captures the direction of lighting from the sun, and the different textures of the subject, like the smooth stones, rough lawn, and pointy blades of grass. Hammond’s way of evocatively presenting common poses and scenes with conscientious applications of value and color is a style I hope to emulate in my own work. Hammond, Lee. Drawing in Color : Drawing in Color - Animals. Cincinnati, US: North Light Books, 2002. ProQuest ebrary. Web. 22 February 2017. John Everett Millais was one of the most celebrated and successful British artists of the 19th century. He was born in Southampton, England in 1829 into a moderately wealthy family that supported his artistic training from an early age. At age 11, he was the youngest pupil to enter the Royal Academy School in London, and subsequently became a star student, winning several awards for his drawings and paintings. In 1848, Millais became one of the Pre-Raphaelite Brotherhood’s founding members, along with artists William Holman Hunt and Dante Gabriel Rossetti. The group was inspired by paintings dating prior to the High Renaissance (~1500), and sought to rebel against the academic conventions taught by the British art establishment of the 19th century. Their style was characterized by the use of vibrant colors, fine attention to details, and complex compositions. In the 1850s, Millais gained celebrity through his successes in book and periodical illustration, creating over 300 images in total. He also participated in the Aesthetic Movement in the 1860s, and in doing so contributed to a renewal of interest in decorative art of the 18th century. By 1870, he had established a successful business in portraiture, allowing him to achieve great wealth and status. Alongside his portraiture, Millais continued to produce a wide variety of paintings, including landscapes as well as those focusing on historical and religious subjects. After briefly serving as President of the Royal Academy, he passed away in 1896, and is buried in St. Paul’s Cathedral. Ophelia is one of Millais’s most well known works from his Pre-Raphaelite period. The painting depicts a scene from Act IV of Shakespeare’s Hamlet, in which Ophelia drowns herself in a stream after Hamlet murders her father. From July to October of 1851, Millais spent up to eleven hours per day painting at a river in Surrey, and carefully observing the elements of nature that are included in the painting. The style of this painting was unique in that it depicted a Shakespearean character with an intense realism in a natural, rather than theatrical, setting. Ophelia also speaks to Millais’s great talent for portraiture. He has been observed to create portraits by placing the sitter and the canvas side by side to allow for more direct comparison, and his depiction of the sitter, Elizabeth Siddal, was praised for being the most accurate likeness of her ever made. 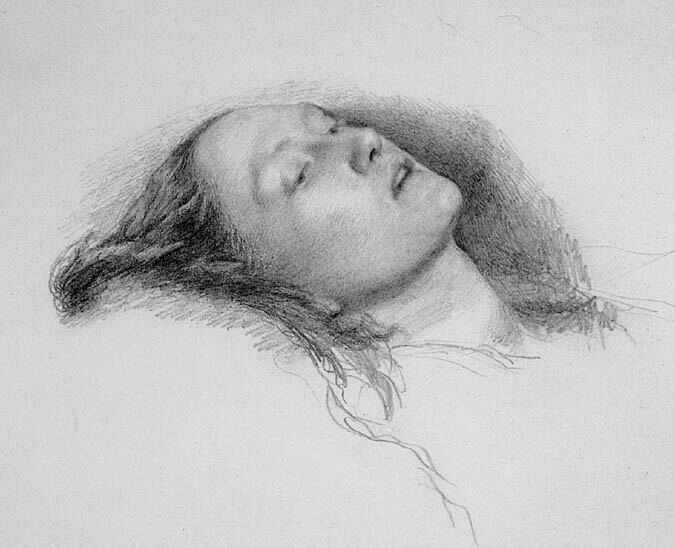 His skill and sensitivity is also evident in the study of the head for Ophelia, shown above, a drawing that is complex and remarkable in its own right. It departs from traditional conventions of portraiture in that the subject’s gaze is diverted, and also highlights the unique qualities of the sitter, such as her pale eyelashes. 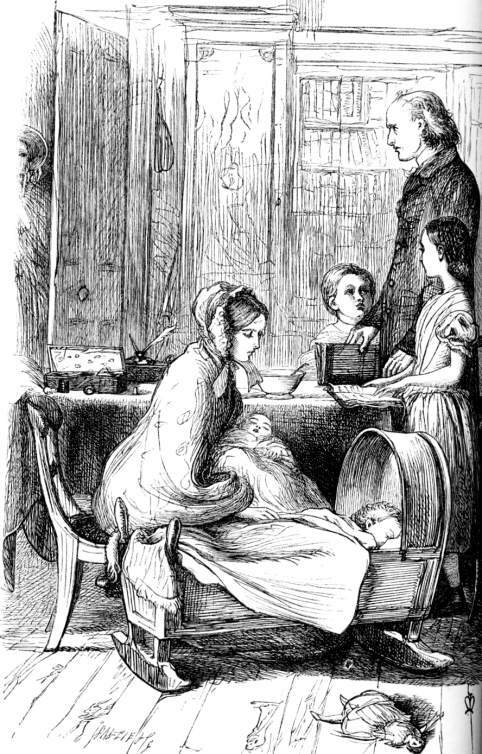 Millais produced the above illustration for Anthony Trollope's novel, Framley Parsonage. Millais and Trollope had a sustained collaboration, with Millais illustrating six of Trollope's novels. Millais is recognized for his skill and versatility in textual interpretation, which allowed his illustrations to enrich the written material. The Crawley Family exemplifies how Millais used symbolic details to support or add more dimension to the text. As noted by scholar Simon Cooke, its placement of the cradle at the base of the drawing and of Crawley at the top serves to highlight the journey from youth to adulthood, and the cycle of life. Leisure Hours is considered to be one of Millais’s contributions to the Aesthetic Movement, and reflects his interest in abstract beauty. The painting depicts Marion and Anne Pender as part of an arrangement of decorative and beautiful objects. Close attention is paid to the ornamental details, such as the lace trim and red velvet of the dresses, the green textile floor, and the Spanish leather screen in the background. Though this portrait was created after his time in the Pre-Raphaelite Brotherhood, it still shows traces of Pre-Raphaelite influence in its refusal to flatter and idealize the subject. Unlike that of other portraitists of the time, Millais’s works are not theatrical or flamboyant, but rather use reserved poses and pay closer attention to the sitter’s individuality. I chose to study Millais because I am fascinated by the coupling of the beauty and skill of his portraiture with his lush, decorative depictions of the surrounding environment. I first became interested in his work after seeing Ophelia at the Tate Britain in London, which impressed me with the ethereal quality imparted on its sitter, as well as the intricately detailed and delicate renderings of the natural setting. The complexity of Millais's compositions brings a multi-dimensionality to his paintings that is particularly compelling. It is also interesting to me how his work challenges artistic conventions in portraiture, particularly through its nuanced realism and focus on the sitter's idiosyncrasies. Cooke, Simon. "John Everett Millais as an Illustrator — Significant Gesture, Expressive Line, and Emblematic Detail." The Victorian Web. 11 Nov. 2009. Web <http://www.victorianweb.org/art/illustration/millais/cooke.html>. Cruise, Colin. Pre-Raphaelite Drawing. New York: Thames & Hudson, 2011. Print. Riding, Christine. John Everett Millais. London: Tate, 2006. Print. Goldman, Paul. John Everett Millais : Illustrator and Narrator. Eds. Birmingham City Museum and Art Gallery, Leighton House, and Tessa Sidey. Aldershot, Hampshire: Lund Humphries 2004. Print.